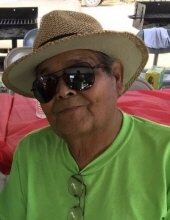 A mass of Christian burial for longtime Granada, Colorado resident, John R. “Ray” Montez will be held at 10:00AM on Thursday, November 29, 2018 at the St. Frances of Rome Catholic Church with Reverend Nicodemus Urassa as celebrant. A rosary service will be held prior to the mass at 9:30AM at the church with Josie French reciting. Inurnment will follow at the Hillside Cemetery in Granada. Per John’s request cremation will take place and there will be no visitation. John was born on June 26, 1940 at Boone, Colorado to Joe and Begnina (Garcia) Montez and passed away on November 23, 2018 at his home in Granada with his family by his side at the age of 78. John is survived by his wife, Gloria Montez of the family home in Granada; children, Ray (Theresa) Montez of LaSalle, Colorado, Jeannette Dardeen of Lamar, Mary Lou Montez of Lamar, Eloise (Joseph) Gallegos of Bristol, CO, Alfred Montez of El Paso, TX and Carlos Montez of Marysville, WA; sixteen grandchildren and twenty eight great-grandchildren. He is also survived by his siblings, Aurora Gonzales of Pueblo, CO, Jennie (Fermin) Moncivaiz of Meadow Lake, NM , Josie Jaramillo of Bernal, NM, Frances (Manuel) Viscarra of Granada, Cecilia (Robert) Lujan of Stockton, CA, Ramon Ernesto (Martha) Montez of Las Animas and Irene (Jr.) Ortiz of Colorado as well as numerous nieces, nephews, other family and a host of friends. To send flowers or a remembrance gift to the family of John Ray Montez, please visit our Tribute Store. "Email Address" would like to share the life celebration of John Ray Montez. Click on the "link" to go to share a favorite memory or leave a condolence message for the family.